It’s not as outlandish as you might think. A “bird-friendly beer” really depends on how you look at beer ingredients and if they have content that actually helps birds. Well, we are in luck. And whether you are a beer fan or not, this may be of interest. Ingredients in beer may vary culturally in such countries as the Netherlands, Japan, Mexico, Great Britain, and Belgium, but in the U.S. most brands of beer have used barley as the main ingredient in brewing. It’s the “adjunct” ingredients that may now draw our attention. “Adjunct” refers to any beer ingredient other than malted barley used to contribute sugar for fermentation (including sugar itself) in making beers. Mass market beers, and even craft beers, use these adjunct ingredients. They can include wheat, rye, oats, corn, and rice. Of these, one element surely stands out: rice. Since American rice in the United States is the most bird-compatible, mass-produced, popular crop in the country, it deserves special consideration. Although the total acreage of rice grown in the United States (c. 2.8 million acres) may be less than that used by some other crops – corn, soybeans, wheat, cotton, and sorghum, for example – rice is actually critical for our wetland birds. Today, American rice farms, many of them family farms, serve as “surrogate wetlands” to supplement natural wetlands that have decreased over time. Rice production creates a modest but essential replacement ecosystem, helping to ameliorate losses of native wetland habitat. It’s important for waterfowl, shorebirds, long-legged waders, rails, and many other species. Separating rice at processing mills results in “head rice” (whole-grain) and different grades of broken kernels, or “brewer’s rice.” In the past, most broken rice in the U.S. went to the beer industry. Today, most of the rice going into beer is whole-grain, while the dog-food industry uses much of the broken rice. Used properly in production, rice lightens the color and body of beer. It has been used much like corn has in beer, but it helps produce a drier product. Rice is very much about clean and dry drinkability. This may not be to your own particular taste, but pale lager still dominates the U.S. beer market, and grains that make beer lighter seem to be essential for most makers of pale lager. Currently, Budweiser uses rice in its production. Indeed, the Budweiser bottle labels announce the rice content: “Brewed by our original process from the choicest hops, rice, and best barley malt.” Among the larger brewers, Coors also uses rice, reportedly, less so. But with some of the biggest beer brands in the country – consider Budweiser, Miller and Coors – now owned by foreign investors, the future of beer here is still in flux. 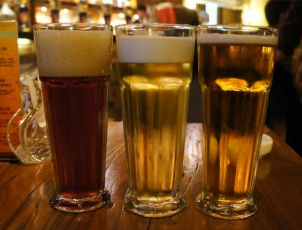 At the same time, local craft beers continue to grow, with some of them using rice in the brewing process. So far, no major brand has pitched itself as a bird-friendly beer, but perhaps it’s only time before that happens. And, yes, experts say that one could probably make beer from 100 percent rice, but it probably would be very bland! Consider rice and wetland birds the next time you order up a brew or go shopping for a six-pack. ©Copyright 2014-17 Lower Colorado River Basin Coalition. All Rights Reserved.